For a single with a length of 8.2m and a velocity of 8.42 m/s (1:43 per 500m), the Reynold’s number amounts to for water of 10 degrees C. This gives with the ITTC equation. Assuming the wetted area for a single with a rower weighing 80kg to be 2.25 m² as claimed by Cambridge Racing Shells to be the value for a Fluidesign single, I obtain N s²/m². Using Granger’s equation, I get 2.81 N s²/m². For a four with a wetted surface of 6 m², I get 6.7 N s²/m² using the ITTC equation. Skin drag is not the only form of drag. There is also form drag and wave drag. It is said that skin drag accounts for about 80% of the drag (Ana Dudhia). So, dividing my number by 0.8 I get a value of amounting to 3.51 for the single scull at race speed. Pretty close to the value I have used so far. The difference is a slight dependence on the shell’s velocity for the value of . 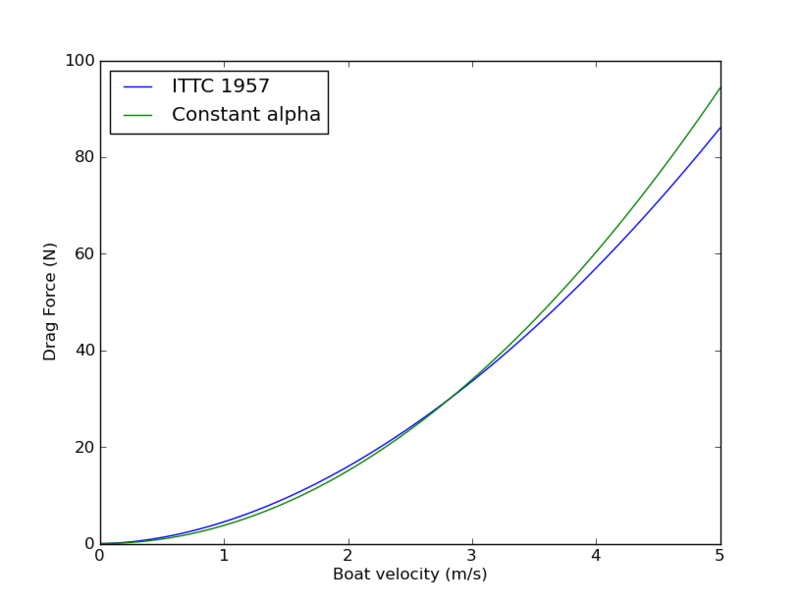 In figure 1, the drag force using the ITTC equation is compared with the simplified method of taking constant drag coefficient, for a single scull with a rower weighting 80kg (wetted surface of 2.25 m²). The differences are small but at maximum velocity they can be of the order of 10%. The division by 0.8 to account for other forms of drag seems a bit arbitrary. Interestingly, when I try to validate the model on the Lucerne 2010 (no wind) boat speed and ergometer scores of Ondřej Synek, the 2010 world champion in the single, I get a consistent story. Synek’s Lucerne achievement was a power of 586W on the 2k (calculated using the ITTC equation value for drag). Assuming 25W is consumed in moving a 98kg heavy athlete up and down the Concept 2 slide, the remaining ergometer power of 561W corresponds to a 2000m time of 5:42 on the ergometer. Synek is known to have rowed 5:41.8 (Czech National record). This entry was posted in rowing physics on November 18, 2010 by sanderroosendaal.